What's this?! A gaming post, seriously?! 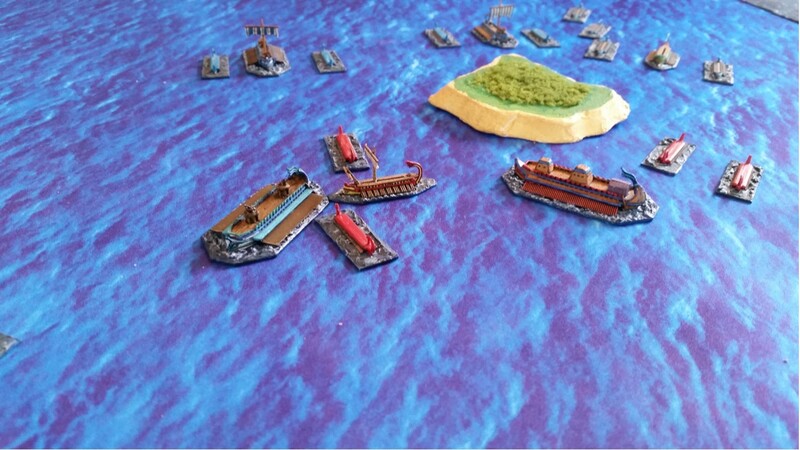 Yes, it is :) Anyway, with the help of my gaming buddy and retired AF Tactical Air Controller, Ted H. we finally got to play test Poseidon's Warriors written by John Lambshead. 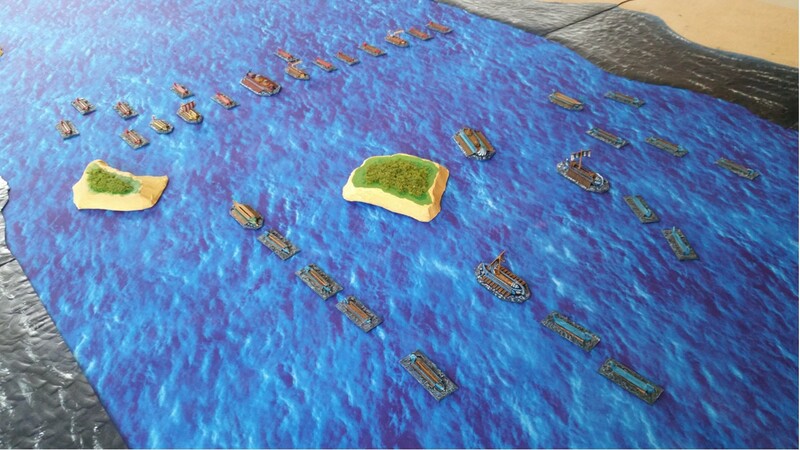 Ted brought over a fine sea mat and coastline terrain which suited the Channel Dash scenario rather well. Being our first time playing the rules we of course got a few things off - like not realizing until about turn 8 that the Operational phase passed back and forth between opposing fleet squadrons. We didn't use the Artillery rules and just concentrated on Ramming and Oar Strikes. 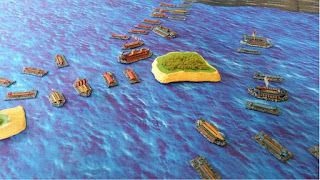 We also didn't try out any of the Advanced Rules such as Corvus, Leaders and Towers, etc. The rules are very simple with very little chart referencing. Anyway, Ted won the battle as I failed my Morale check after my fleet's flagship had taken part in a second combat. Ted passed his Morale check having lost a quarter of his fleet. 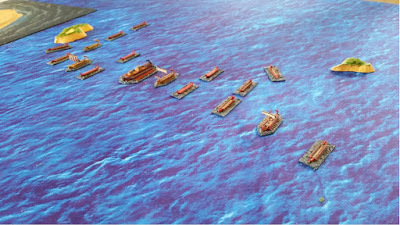 Ted's fleet in nice line ahead formation at the start of the game. 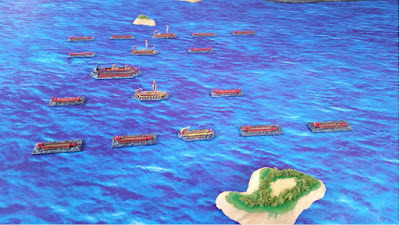 Those are his little islands on his nice sea mat. Ted's fleet now mostly in line abreast formation - looking for a fight. My fleet trying to figure out what to do with the islands in the channel. Ted's fleet blocking access to the sea in line abreast. One of my trireme squadrons having turned 180 degrees away from the enemy. 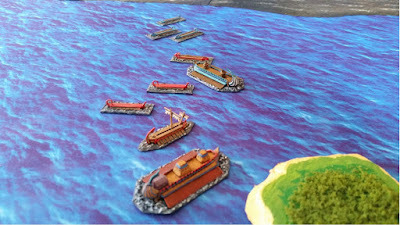 Having "lured" Ted's fleet into the tighter confines of the channel behind the little islands, one of my trireme squadrons (top of the photo) has Rammed some of his triremes. 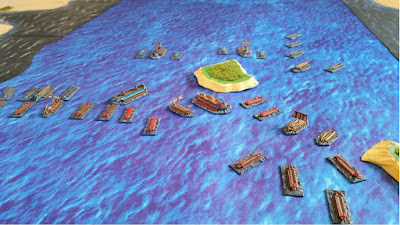 The rules allow for bow rams to be fought simultaneously. My fleet flagship has also Rammed one of Ted's triremes. 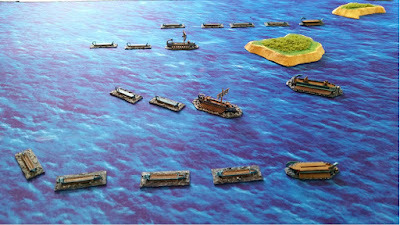 Ted suffered the worse and lost several of his triremes. My flag ship suffered one Hull point loss. 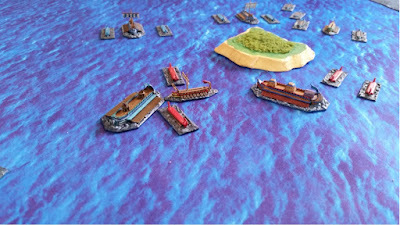 Another view of the turn with my triremes and flag ship Ramming some of Ted's ships. My flag ship completing a successful Oar Strike against one of Ted's trireme - actually the sole-surviving one from the squadron which fought in the previous turn. Here's where the battle turned. Two of Ted's Quadriremes were able to Ram my flag ship, which later failed its Morale save and ended the game. These rules are very fast playing, and with quite brutal combat resolution. I plan to try out the Artillery rules as well as some of the Advanced rules the next time.